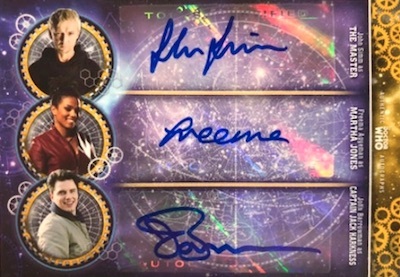 Chase the stars of space and time with 2018 Topps Doctor Who Signature Series. The all-autograph release is exclusive to the Topps online store. 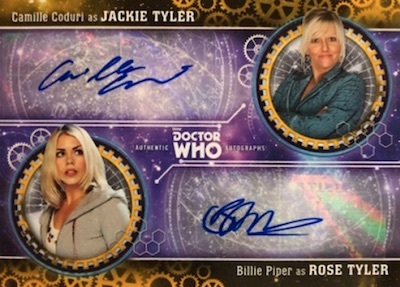 The 2018 Topps Doctor Who Signature Series checklist features 78 signers in the main Autograph set. This includes many of the previous Doctors, such as David Tennant as The Tenth Doctor, as well as companions Rose Tyler (Billie Piper), Clara Oswald (Jenna Coleman), and even James Corden as Craig Owens. Matching up multiple signers are the Dual Autographs and Triple Autographs. Although the same line debuted in 2017, the standard base set is removed for 2018. Priced at $20, each pack has just one card, but it's guaranteed to be an autograph. 78 cards. 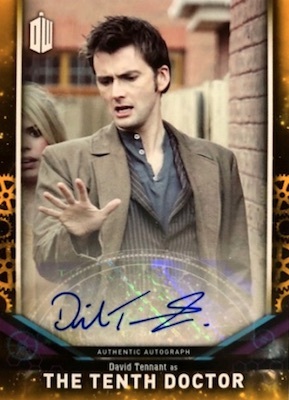 Buy Doctor Who packs on Topps. 11 cards. 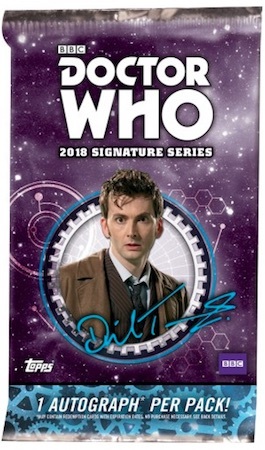 Buy Doctor Who packs on Topps. 7 cards. 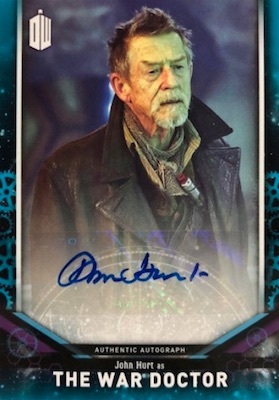 Buy Doctor Who packs on Topps. Well, this is just ludicrous . . . one-card packs, nothing but autographs . . . I suppose this is the natural progression in a hobby that isn’t interested in anything other than “hits.” What’s the point of even selling these cards in packs? Oh, never mind, I know the answer: getting collectors to roll the dice with $20 when the odds are you’ll get an autograph that will bring less than $10 on eBay. I suppose I should be grateful to Topps . . . in 2017, they had an unautographed parallel “base” set which wasn’t particularly attractive, but it was enough to entice someone like me to pay big bucks for a complete set. At least this year I won’t have to worry about THAT temptation . . .